I haven’t written much about Shrewsbury, Shropshire’s county town, but I have been in the process of a post or three for several months, during which time I have been preparing many photos for the blog. The town contains some very interesting architecture from medieval black and white timber-framed to very elegant and simply styled Georgian properties. (And some 1960s carbuncles, but we won’t talk about them). This distinctive red-brick Victorian built building is along the Town Walls. The Eye, Ear and Throat Hospital opened in 1881. It earned a reputation for its high standard of treatment and during WW1 was a major clearing centre for troops with eye injuries, treating up to 800 soldiers a week. It closed in 1998 and has been turned into flats. Built in the style of the Arts and Crafts Movement with ornate decorative bricks and tiles/panels, the style placed great value on the work, the joy of craftsmanship and the natural beauty of materials. I have a walk around the town which I need to break up into a few posts and sort out the photos. Soon, I promise! When I last visited Shrewsbury, ‘Cadfael’ was all the rage on TV. The town had various ‘Cadfael’- based exhibitions, walks, and displays. I liked the small castle too. Shrewsbury has quite a lot to offer, and I always feel it is somewhat neglected as a tourist destination. Perhaps because it is so far from the coast. I don’t think Shropshire on the whole is very good about promoting itself as a tourist destination. Many people don’t even know where the county actually is! I shall write more about the town – or at least put up some photos as Shrewsbury is a pleasant town on the whole. I used to follow Pauline Fisk’s interesting blog, My Tonight from Shrewsbury, and was sad when she died. I have been once but a very long time ago and liked it. I live in Shrewsbury so this is a very familiar building to me! I remember it as a hospital and still know one of the consultants (now retired) who used to work there. As you say there have been one or two ‘mistakes’ in the town, mainly in the 70’s, but in the main it remains a superbly historical place to visit and live in. Thanks for your post. It is a lovely building, I’d quite like to go inside and see what it is like, especially those windows. I am glad that it has been converted rather than pulled down. What a beautiful building! There are so many lovely reminders of history and great architecture all over England. Thanks you for sharing so many of this beauties with us. Last week I visited Kelling Hospital, Holt and was impressed with many of the smaller buildings, also built in the style of the Arts and Crafts Movements. There are some architectural gems about. I love the Arts and Crafts Movement. We visited Shrewsbury specially to do the Cadfael things and I loved it. I hope we get to visit again one day, but in the meantime I’ll be looking forward to your posts. I love the detail under that window. It’s not the kind of thing that you’d ever be likely to see in a modern building. That brick work reminds me of the Watts Chapel, Jude. I bet those flats are stunning! I had the same thought Jenny, though I suspect the inside is not as stunning as the chapel. This is such a wonderful buiding, Jude, with its decorative terracotta panels. I knew it at once as I skimmed through the reader. A fine photo, and interesting to hear of the hospital’s valuable role during WW1. 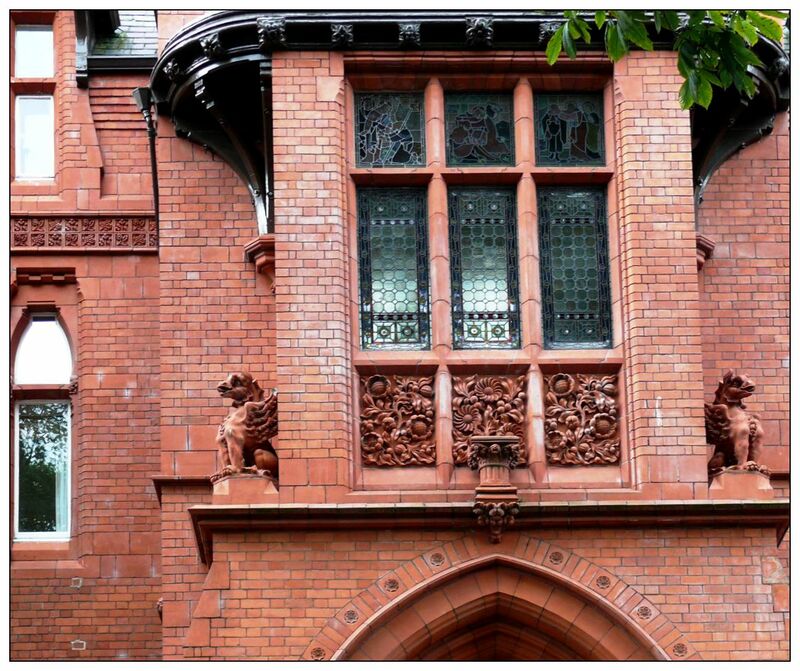 The window and its surrounds are beautiful, I can’t imagine such workmanship being applied to a hospital today. The Victorians left an amazing legacy – at great cost to many though. We used to have a very important eye ‘infirmary’, a fine building, now a rather expensive hotel, sigh! It is the only one of its type I have noticed in the town. The craftsmanship is superb and a testament to the workers that it has lasted so long. Wow, that’s a gorgeous building Jude! It’s a beautiful building – it would be lovely to live in something like that. I wonder what the rooms are like?